ريتشارد هـ. ثالر ( /ˈθeɪlər/؛ وُلد 12 سبتمبر 1945)، اقتصادي أمريكي وأستاذ رالف ودورثي كلر للخدمة المتميزة في الاقتصاد السلوكي والاقتصاديات كلية بوث للأعمال بجامعة شيكاغو. يشتهر ثالر كمنظر في المالية السلوكية، ولتعاونه مع دانيال كانمان وآخرون في تعريف مزيد لهذا المجال. في 2017، حاز جائزة نوبل في الاقتصاد من أجل إسهاماته في الاقتصاد السلوكي. عند مناقشة اختياره للفوز بجائزة نوبل، وضحت الأكاديمية السويدية الدولية للعلوم بأن السبب يرجع إلى "إسهاماته التي بنت جسر بين التحليل الاقتصادي والنفسي لصناعة القرار الفردية. وكانت نتائجه التجريبية ورؤيتهه النظرية مفيدة في خلق مجال جديد وسريع التوسع في الاقتصاد السلوكي." Thaler, Richard H. 1992. The Winner's Curse: Paradoxes and Anomalies of Economic Life. Princeton: Princeton University Press. ISBN 0-691-01934-7. Thaler, Richard H. 1993. Advances in Behavioral Finance. New York: Russell Sage Foundation. ISBN 0-87154-844-5. Thaler, Richard H. 1994. Quasi Rational Economics. New York: Russell Sage Foundation. ISBN 0-87154-847-X. Thaler, Richard H. 2005. Advances in Behavioral Finance, Volume II (Roundtable Series in Behavioral Economics). Princeton: Princeton University Press. ISBN 0-691-12175-3. Thaler, Richard H., and Cass Sunstein. 2009 (updated edition). Nudge: Improving Decisions About Health, Wealth, and Happiness. New York: Penguin. ISBN 0-14-311526-X. Thaler, Richard H. 2015. Misbehaving: The Making of Behavioral Economics. New York: W. W. Norton & Company. ISBN 978-0-393-08094-0. ^ Appelbaum, Binyamin (October 9, 2017). "Nobel in Economics Is Awarded to Richard Thaler". The New York Times. ^ Gauthier-Villars, David (October 9, 2017). "Nobel Prize in Economics Awarded to American Richard Thaler". The Wall Street Journal. ^ Keyton, David; Heintz, Jim (October 9, 2017). "American Richard Thaler wins Nobel Prize in Economics". Associated Press via USA Today. ^ Tetlow, Gemma (October 9, 2017). "Richard Thaler awarded 2017 Nobel prize in economics". Financial Times. ^ Pollard, Niklas; Ringstrom, Anna (October 9, 2017). "We're all human: 'Nudge' theorist Thaler wins economics Nobel". Reuters. Roberts, Russ (November 6, 2006). 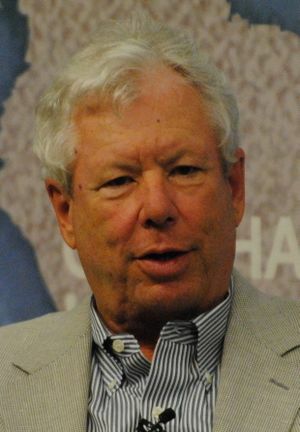 "Richard Thaler on Libertarian Paternalism". EconTalk. Library of Economics and Liberty.